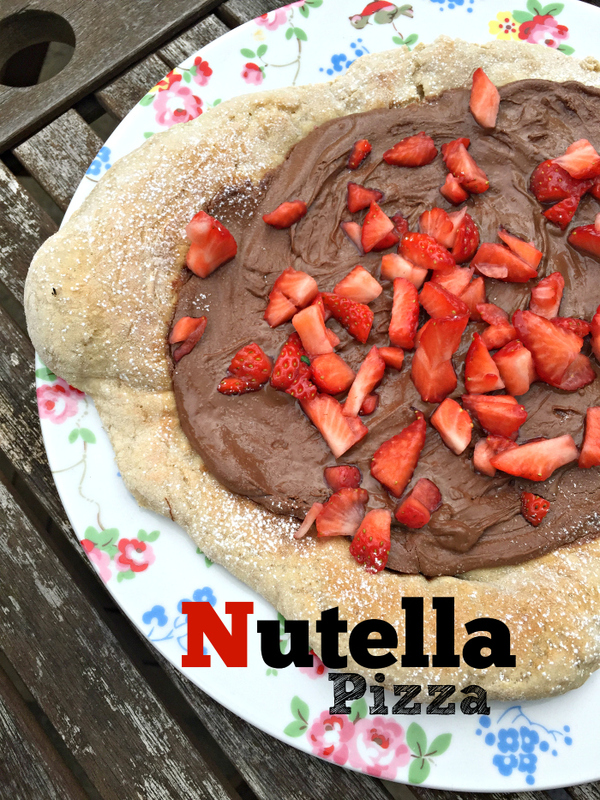 Classic pizza crust covered with chocolate hazlenut Nutella spread and fresh strawberries – It’s true, pizza isn’t just for dinner – it’s for dessert too! Every once in a while, you need to go completely over the top amazing and outrageously delicious with your food choices! 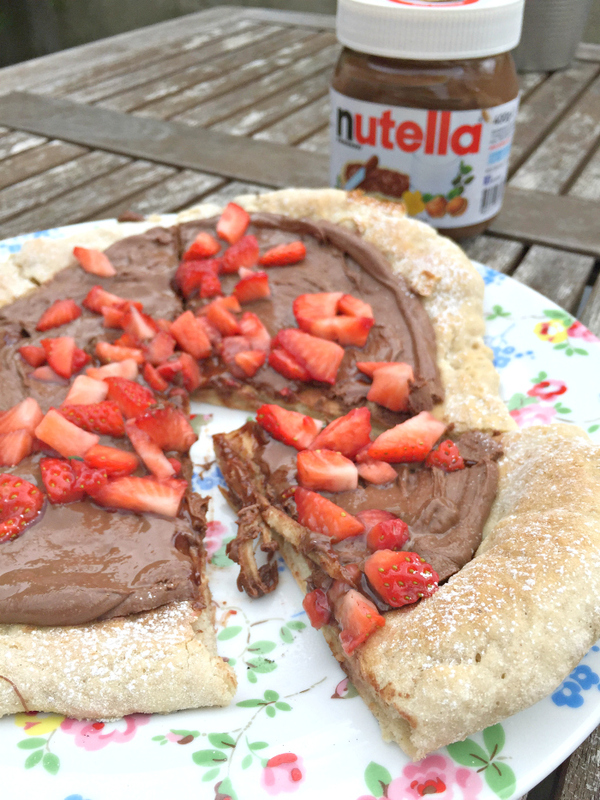 This strawberry nutella pizza fits into that category! One of my favourite things about summer is having people over for dinner in the garden (don’t even talk to me if you have a pizza oven in your garden – looking at you Sarah! )- one communal veggie loaded big pizza for dinner, followed by this for dessert? Perfect – and so little effort! 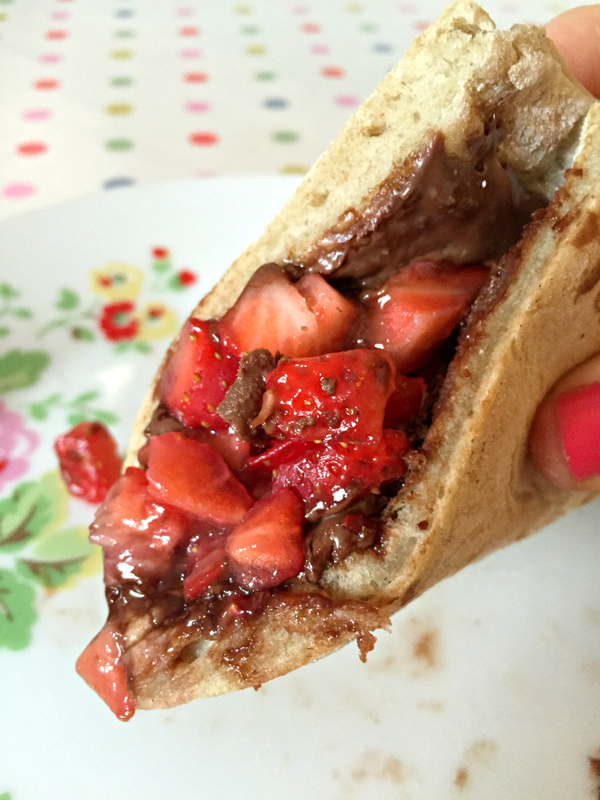 Homemade pizza, melty nutella and fruity strawberries are a match made in heaven in this simple, crowd pleasing (especially if the crowd contains some 13 year olds!) dessert! Mmmm melty nutella. Is there anything better in the whole world? 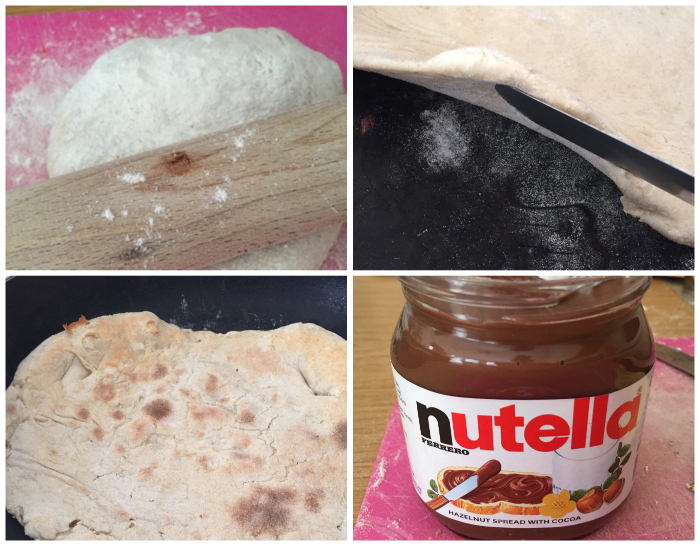 Making your own pizza dough is so simple – for a special carby treat, double (or triple) the recipe below and make a savoury pizza as well as a sweet one! My favourite method for cooking these pizzas is using this one, recommended recently by The Guardian. Added bonus – it’s quicker and easier than waiting for it to cook in the oven too! You just roll out your dough into a round (well – floured) and pop it (naked) into a very hot saucepan on the hob with no oil. Once the bottom is cooked (you can lift up the edge to see) put the whole thing under the grill for a minute (still in the pan) until browned, then slather on nutella and strawberries and dust with a little icing sugar. To make your pizza dough, start with 3 cups of plain flour, the salt and the yeast in a large bowl. Mix the dry ingredients to combine, and then add tepid water until you've got a wet dough - don't worry about kneading it at this point, or the fact that it's sticking to the bowl. Cover with a damp cloth and leave to rise in a preferably warm place for about an hour. After an hour, add more flour to the dough, and use a spatula to get it all out of the bowl and onto a floured work surface. Knead it for a moment until its a cohesive, springy ball, then flour and roll it into a thinnish circle. Ensuring both sides are floured and not sticky, place it onto a pre-heated (Very hot) large non stick pan on the hob and cook for about 4-5 minutes, until the bottom is browned and crispy. Pre-heat your grill and pop it under - still in the same pan - for just another 2-3 minutes. 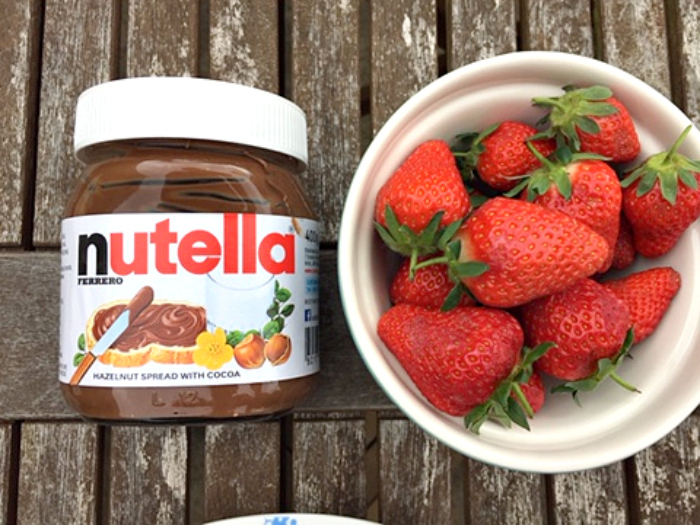 Remove and immediately cover with the nutella and fruit, and serve. There are also a few different versions of sweet pizza – along with ones like this on a regular pizza base, you could try a fruit pizza on a sugar cookie base, or even on a chocolate or chocolate chip cookie base! Oh my word! Yes, please! I never heard of cooking pizza in a pan like that – what a fab way to get pizza into your mouth as QUICKLY as possible. Mmmmm, nutella. Diane @ Life of Di. recently posted…May: Currently. Ah I love dessert pizzas! Best invention ever. There is a restaurant near me that has about 10 different types on their dessert menu. We often go there just for pudding 🙂 this looks great! Now I could get behind this chocolate pizza and eat nothing but it for a week. Cookie-dough addict, rainbow cake lover, friend to cats, never met a pizza I didn't like. VERY enthusiastic human. Homebody and adventurer. Nice to meet you! Some of the links on this site are affiliate links, which means that if you click on it and go on to buy something, I might earn a few pennies (and it will cost you the same!). Get Kerry Cooks posts direct to your inbox! Enter your email address below to get new posts by email, it's FREE! Hey Buddy!, I found this information for you: "Strawberry Nutella Pizza". 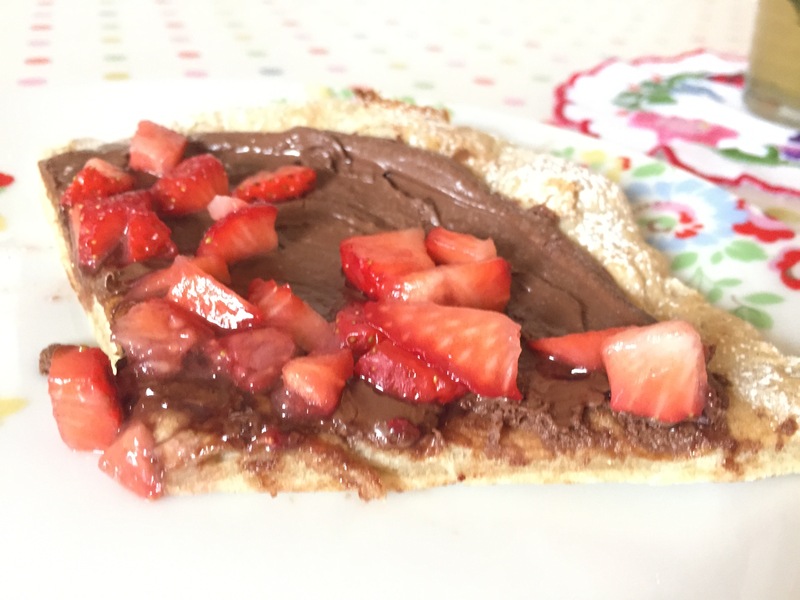 Here is the website link: https://kerrycooks.com/strawberry-nutella-pizza/. Thank you.